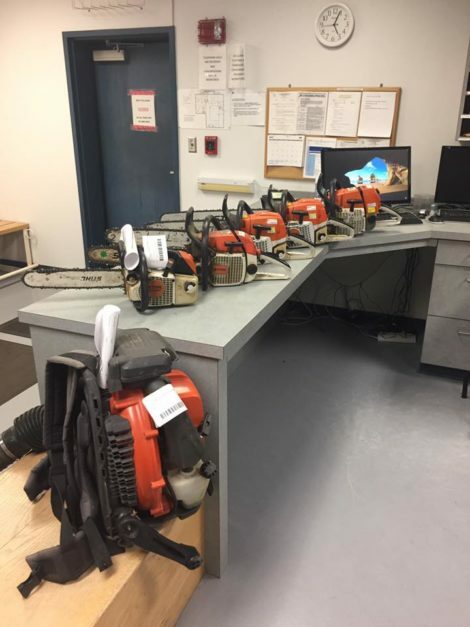 Great Barrington Police recovered the chain saws and leaf blower stolen from a local landscaper, and displayed the items in police headquarters. Great Barrington — As a result of an investigation, the Great Barrington Police Department has arrested five men after a local landscaper reported several of his power tools stolen from his truck, police Chief William Walsh said. On July 20, police received a complaint from the landscaper that he was missing five Stihl brand chainsaws and a leaf blower from his work truck. 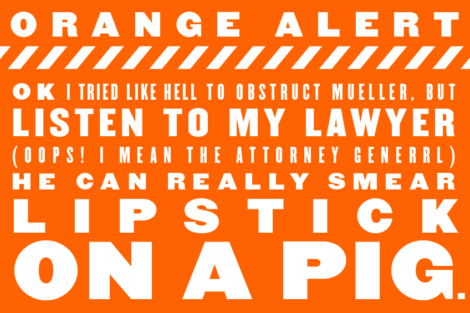 An investigation ensued. Later that day, police on patrol found two men engaged in apparent intravenous drug activity and an investigation into that activity uncovered heroin, needles, one of the stolen chainsaws and the stolen leaf blower, both of which were located in one of the suspects’ cars. 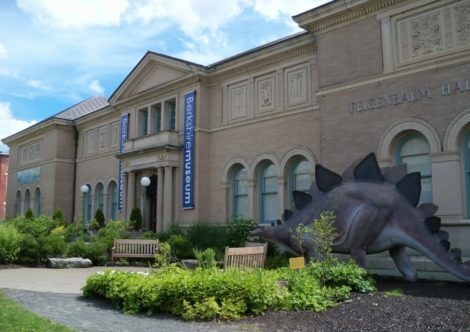 Great Barrington police allege that three suspects allegedly stole the items from the landscaper and pawned them to purchase drugs with the other two men. Daryl VanDeusen, 25, homeless, was arrested and charged with breaking and entering into a motor vehicle and larceny over $250. Michael Thorpe, 35, and Shawn M. Keefner, 27, both of Main Street in Great Barrington, were arrested and face the same charges as VanDeusen. Jeremony Babcock, 28, of Park Street in Housatonic, was arrested and charged with possession of a Class A substance (heroin). Also arrested was Jeremy McDermott, 25, of Stockbridge. McDermott was charged with receiving stolen property, which was found in his vehicle. Four stolen chainsaws and the leaf blower have been recovered. The investigation remains active and ongoing, and additional suspects may be identified and charged. Thorpe pleaded guilty at arraignment Monday in Southern Berkshire District Court and was sentenced to 120 days in Berkshire County Jail and House of Correction. The others were held on bail pending arraignment. Walsh emphasized that these are allegations. All suspects are considered innocent until proven guilty. While i am sympathetic to the problems of the homeless person and the opoid-addicted persons, it must be said: You do not steal tools from workers. How about you don’t steal from anybody. No place is so serene that it’s free of the drug epidemic.